Show off your signature style with a sleek and customizable clipboard. Personalize with your name or initials. We have many font styles and text banner backgrounds to choose from. 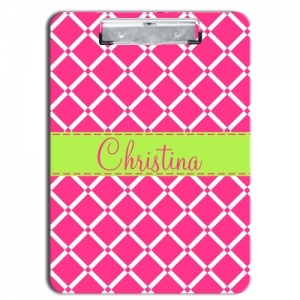 These clipboards are made using a process called sublimation. This causes the image to become part of the product that it is printed on, so there is no fading or peeling. Clipboards are printed on front and back and are dry erase.